The quest for his great-uncle Najib Nassar, an Ottoman journalist – the details of his life, and the route of his great escape from occupied Palestine – consumed award-winning writer Raja Shehadeh for two years. As he traces Najib’s footsteps, he discovers that today it would be impossible to flee the cage that Palestine has become. 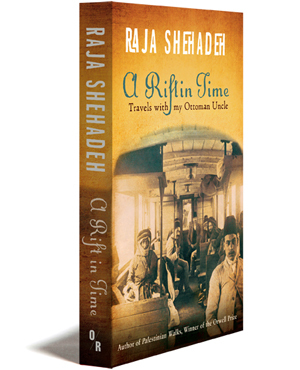 A Rift in Time is a family memoir written in luminescent prose, but it is also a reflection on how Palestine – in particular the disputed Jordan Rift Valley – has been transformed. Most of Palestine’s history and that of its people is buried deep in the ground: whole villages have disappeared and names have been erased from the map. Yet by seeing the bigger picture of the landscape and the unending struggle for freedom as Shehadeh does, it is still possible to look towards a better future, free from Israeli or Ottoman oppression. 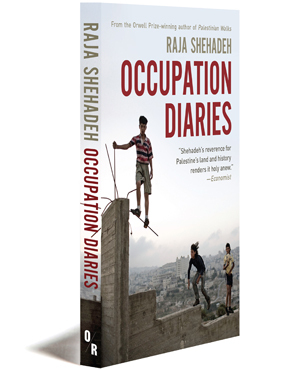 Raja Shehadeh is the author of When the Bulbul Stopped Singing, Strangers in the House, described by the Economist as “distinctive and truly impressive,” and Palestinian Walks, for which he won the 2008 Orwell Prize. Shehadeh trained as a barrister in London and is a founder of the human rights organization Al-Haq. He lives in Ramallah, on the West Bank. My mother had just called Hanan in a panic to dispatch my brother to my aid, convinced that the Palestinian security police would be at my door any minute. She was frantic. An anonymous official from the office of the Attorney General had rung her to ask about me because they did not have my phone number. Prudently, she refused to reveal it. ‘Don’t worry. We’ll find him,’ he had menacingly said before hanging up. I wasted no time. I quickly put on thick underwear, tucked my toothbrush in a pocket and pulled on an extra sweater, prison survival tips learned from experienced security detainees I had represented in the past in Israeli military courts. Jericho, the site of the new Palestinian security prison and the old Israeli military government headquarters, can get very cold at night. On that evening of 18 September 1996 I sat huddled in the courtyard of our new house and waited for the knock on the door, trying to pretend I was neither worried nor angry. which I had devoted all my energies to bringing about change and a conclusion to the Israeli occupation. I had spent years challenging illegal Israeli land acquisitions in the occupied West Bank. Ironically, the unfounded claim that was now being made against my client was that he was selling land to the enemy by going into partnership with an Israeli corporation for the establishment of a gambling casino in Jericho, and I was accused of helping him with this venture. It was a false claim fabricated by some powerful members of the governing Authority who were hoping to intimidate my client into withdrawing from the project so that they could replace him in this lucrative enterprise. Prompted perhaps by disappointment over the false peace heralded by the signing of the Oslo Accords, and despite all the fanfare on the White House lawn, my thoughts had been turning to the past, to the time when it all began. I had been reading about my great-great-uncle Najib Nassar, who like me was a writer, and like me a man whose hopes had been crushed when the Ottoman authority of his day sent troops to arrest him. But unlike me he did not wait for the knock on the door. It was from my maternal grandmother, Julia, that I first heard of Najib. But he was always spoken of with ambivalence. He was the odd man out in the Nassar family, the one who was preoccupied with resistance politics during the British Mandate period while his brothers were making a good living, one as a hotelier, another as a medical doctor, a third as a pharmacist, all well-to-do, established members of the professional middle class, while he mingled with the fellaheen, the peasants, and lived for a while among them. Even worse, he associated with the Bedouins, spoke and dressed like them and generally adopted their ways. My grandmother told me about a visit he once made to the family home in the Mediterranean city of Haifa. Hearing this, I was intrigued. No one had mentioned the order for his arrest by the Ottoman government. I was left to wonder why he went to live out in the wild. What was he running away from? And why was he so poor? How did he lose his money? Did he gamble it away? To locate the places where Najib found refuge during his long escape from the Ottoman police, I first used a map made by the Israeli Survey Department. But I soon discovered that, in the course of creating a new country over the ruins of the old, Israel had renamed almost every hill, spring and wadi in Palestine, striking from the map names and often habitations that had been there for centuries. It was the most frustrating endeavour. If only I could visit this area with someone able to read the landscape and point out where the old towns and villages had stood. I knew just the person, but the Palestinian geographer Kamal Abdulfattah was not allowed to cross into Israel from the West Bank. How Israel manages to complicate and frustrate every project! After the failed attempt at mapping out Najib’s escape route using a modern Israeli map, I managed to retrieve a 1933 map from the National Library of Scotland in Edinburgh. What a relief it was to look at this and envision the country Najib would have recognised, with the villages, hills and wadis in which he had taken refuge reassuringly marked and bearing the names that he had used. In planning the route of his escape, Najib had not been hampered by the political borders that many Palestinians are not allowed to cross today. Under the Ottomans on the eve of the First World War there was no administrative unit called Palestine. Haifa, Acre, Safad and Tiberias were part of the Beirut sanjaq (an administrative subdivision of a vilayet or province). South of that, including Jaffa, Gaza and Jerusalem, was the independent sanjaq of Jerusalem. The south-eastern parts of Palestine were included in the sanjaq of Maan and all of these were part of the vilayet of Greater Syria. The River Jordan did not delineate a political border. Without delays Najib was able to ford it by horse and in no time found himself on the eastern bank in what today is the Hashemite Kingdom of Jordan. When he finally gave himself up he was transported by train to Damascus, a trip that took no longer than two hours. So distorted has the geography become that for us West Bank Palestinians to travel north to Damascus we would first have to travel east, then north, crossing four different countries; and even that is possible only if we are fortunate enough to secure the necessary visas and exit permits from often uncooperative authorities, both Israeli and Arab. his point of departure. This mixed community of Arabs and Jews has become an Israeli city, with most of its former Palestinian inhabitants scattered throughout the world. Najib died on 30 March 1948, just months before the Nakba (catastrophe), the mass expulsion and dispossession of the Arabs of Palestine in 1948 upon the establishment of Israel. Perhaps he was fortunate to be spared that most tragic period in the history of his country. His son, wife, siblings and every one of our common relatives were forced out of Haifa, losing all their property. They did not realise that they would never be allowed to return to their homes and so did not take their personal belongings with them. Furniture, books, manuscripts, memorabilia, family photographs, heirlooms and even personal effects were left behind and never returned. Everything that belonged to them, everything that told their individual stories, was either stolen or seized and deposited in Israeli archives for use by Israeli researchers seeking to understand the history and character of the Arabs whom they were colonising. A further difficulty was that many of the villages and encampments in which Najib found refuge had also been reduced to rubble, as I discovered when I went in search of them in the hills of the Galilee. I had to scan the terrain with an archaeologist’s eye to determine where they had once stood. It was therefore a strange and yet a typically Palestinian quest. Strange because I had to rely heavily on my imagination and train myself to see what was not readily visible. Typical because the process I had to follow to uncover the history of a member of my family is similar to that followed by many Palestinians who had family in the part of Mandatory Palestine that became Israel. I have been able to find only one official Israeli map where all the Palestinian villages existing before 1948 are shown. Next to many of those appears the sinister Hebrew word harous (destroyed). Najib was born in 1865. For the first decade of his adult life had tried his hand at a number of professions, as assistant pharmacist, farmer and translator. Short and plump, he always wore a tarboosh (fez) that leaned forward towards his face in the manner of Beirut merchants. Unlike his brothers, he was not good at making money. He was always involved in pursuing unpopular causes and could hardly earn enough to sustain his family. In 1913, when he was forty-eight, he confessed in an article that he ‘despaired of living a free life under the Ottoman Empire’. This made him decide to emigrate to the United States, as many other members of our family had done. Once he had made that decision, he could ‘hardly wait to organise [his] affairs and prepare [him]self for the big move’. He was feeling ‘only regret for all the efforts [he] applied to establish [him]self in the country’. I found no professional satisfaction in a ruined legal system. There is hardly a resident of Palestine today who has not considered the option of emigrating. I know all too many who, once they made that decision, regretted all the time they had wasted living in Palestine. I too went through a period when I felt the Israeli occupation would never end and I would be doomed to a life of humiliation, oppression and lack of civil rights. I seriously considered emigrating before turning to human rights activism and writing alongside my professional legal work. The outbreak of the First Intifada in 1987 gave me hope that things would finally change and I dismissed all thoughts of leaving Palestine.